With more than 20,000 species growing across 185 acres (75 hectares), Montreal’s expansive botanical gardens are often ranked among the world’s finest. Explore themed gardens—among them, Japanese, Chinese, First Nations, alpine, and medicinal—as well as hot and humid greenhouses dotted with orchids and tropical flowers. The Montreal Botanical Gardens are situated on the same site as the Montreal Insectarium, a family-friendly bug-themed attraction. A single ticket provides access to both. Visitors can also book package tickets, which grant entry to the botanical gardens and the Space for Life museum (either the Biodome or the Rio Tinto Alcan Planetarium). Alternatively, choose a combined ticket to the gardens and the Montreal Tower Observatory, which offers spectacular views over the city and the St. Lawrence River. Select sightseeing passes also include access to the gardens. 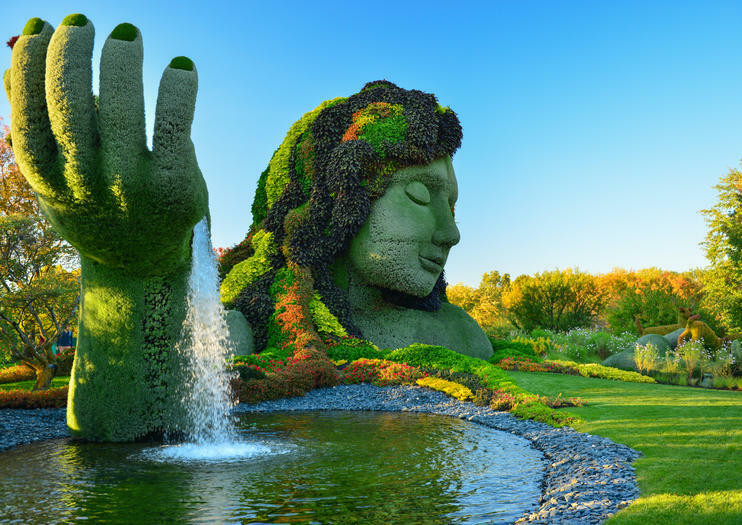 The Montreal Botanical Gardens are a must for families and gardening enthusiasts. A mini-train runs through the gardens in summer; visitors with reduced mobility are given priority access. Interpreter-led tours and activities, from bird-watching excursions to tea-tasting sessions, are regularly held throughout the gardens. There are drinking fountains throughout the site. The gardens have a wheelchair-accessible route that passes the major highlights. The Montreal Botanical Gardens are situated in the Olympic Park, right next to the Biodome, Insectarium, and Montreal Tower. The nearest metro stop is Pie-IX (Green Line), about 10 or 15 minutes away on foot. One of the best times of the year to visit the gardens is during the annual Gardens of Light event, which takes place in fall and sees the grounds lit up spectacularly. In winter, many of the outdoor gardens are covered by snow, though plants grow in the greenhouses year-round. The Montreal Botanical Gardens is one of several attractions within Montreal’s Space for Life museum district, and you can combine a visit with a trip to one of the other nearby attractions. Find out more about the wonders of the universe at the Rio Tinto Alcan Planetarium, watch an ant colony at work at the Montreal Insectarium, and wander through different ecosystems at the Biodome. Though not officially part of the Space for Life site, the Olympic Stadium complex, which contains the Montreal Tower, is also right beside the gardens. Ride the funicular up to the observation deck of the 541-foot (165-meter) tower for bird’s-eye views of Montreal.